We all get sentimental when some stranger calls us “neighbour”, trust me I know how that feels. In a church setting that would be the appellation “bro” or “sis”, some people change churches so they can get stuff from a lot of bros and sistas all at once. I love that story Jesus told about neighbours, you know that man by the roadside, who was beaten up and all sorts of people came by. The annoying part of history is that it always repeats itself! You are young, trying to build a life and let me tell you what usually happens ” Life f*cks you up!”. Like a victim, you suddenly realize you have been robbed and beaten up by government and society, over and over again. This reminds me of so many people who were laid off without compensation in recent times, no one in Nigeria presently under 40 years has not felt the brunt of the economic crunch. 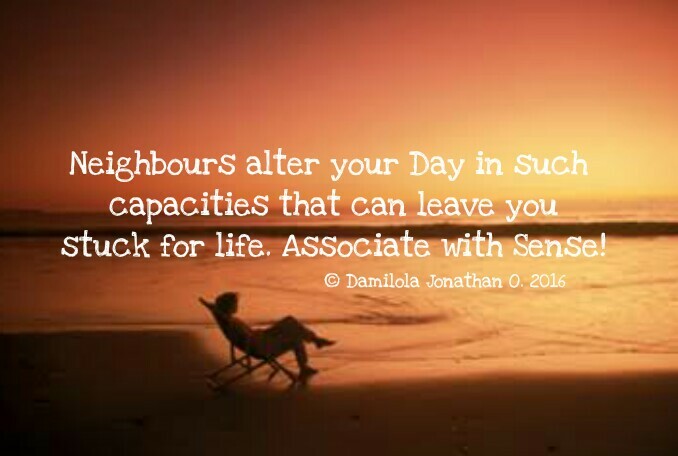 It is not healthy to attach so much importance to some kind of Neighbours, we should be ready to let them go! Especially in times like these. So who are these unwelcome Neighbours? 1. The Hypocrites! Let me break this down for you, everyone thinks everyone else is an hypocrite, so everyone has a piece of advice while they stand aside and watch you burn!!! Avoid people who only interact with you when they have a “piece of advice”. 2. The Cult: they always know the right cliques, they know who you need to support or else you are a “sinner”. I saw one example recently, someone said only unbelievers would support “Donald Trump”, I could care less cause I am not American! Funny enough the person who made this claim is not American too but he believes he has an obligation to form a cult around Trump and if you are not in, you are not IN! Please flee these ones like evil. 3. Blood Suckers: they thrive on your misfortune, they may seem to be totally invisible at the moment but wait till something evil happens. They come to make the evil more EVIL, they mourn “the loss” as if to make you drown in it. They never have an encouraging word, when you are down they are the kind of neighbours who would still come to borrow your Sofa, so that you only have the bare floor to lie on. 5. Regalia Pastors/Ministries: these group of people can make so much noise about nothing, they are found in a lot of controversies over church doctrines of Tithing, giving, and sowing of seeds! Currently Christian children are being married off to Emirs or their aides in Nigeria and you don’t see so much noise about it, some Christians were killed and these Pastors will not speak up, they ask people to give more. These are the kind of neighbours that would dig a hole in the side of your water tank and ask you to fast and pray against the evil forces that are trying to wreck you, they won’t tell you to get a plumber! Neighbours are great assets, friends could be a stepping stone to a lot of great things but it is important to keep the right people around us at all times. Have you had any experience with these kind of issues? Do you think you need to change how you relate to people and the kind of people you associate with? I would love to hear from you in the comments section. Thanks Ruth, Boarding house was one really terrible experience for those of us who had to deal with people like this, its nice that we all came out fine. Thanks for reading. ‘…by the time you come back to your senses you have divided all your fortunes into two and you are helping them move it across the yard.’ This got me giggling. The different shades of neighbours. Nicely written. Thanks Simi, yes the really bad side of wrong association are the things you lose in the process. The hypocrotes and apostolic parasites are common and easy to identify. They are very bad neighbors. Avoid them more than the plague. Kudos big brother!!! Thanks….its better to associate right, because those we associate with define a lot about us.